Bionomic Industries, Inc., a leading manufacturer of environmental control products, has introduced their new ScrubSeal Vacuum Overflow Valves - an innovative overflow and vacuum seal solution to replace troublesome manometer liquid seal legs on scrubber and vessel sumps. Designed to eliminate unreliable, cumbersome manometer piping and the worry of maintaining a liquid filled line, ScrubSeal acts as a check valve to allow drainage of scrubber sump liquid through the overflow line while maintaining required vessel vacuum during normal non-flow conditions. Key ScrubSeal features include ease of installation in either vertical or horizontal pipes, sizes ranging from 3/4" - 4" to meet a broad range of overflow rates from fractional to over 500 gallons per minute, and a choice of valve bodies in corrosion-resistant polypropylene (PP) or chlorinated polyvinyl chloride (CPVC) depending upon size, with durable yet flexible EPDM internal elements to withstand many cycles of use. 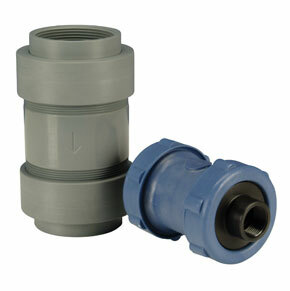 As an added safety feature, ScrubSeal prevents the unrestricted siphon rise of liquid within the vessel, a situation that can cause structural damage from excessive hydrostatic pressure - resulting in potential costly damage to downstream equipment or product contamination due to scrubbing liquid passing through the horizontal gas inlet.